This graph shows how carbon dioxide has increased and decreased over hundreds of thousands of years. The low readings match with times called 'glacial stages'. During glacial stages, ice covered large areas of the Earth. The peaks in the graph show times when carbon dioxide was high, matching times called 'interglacial stages'. The most recent glacial stage occurred between about 115,000 and 11,500 years ago. 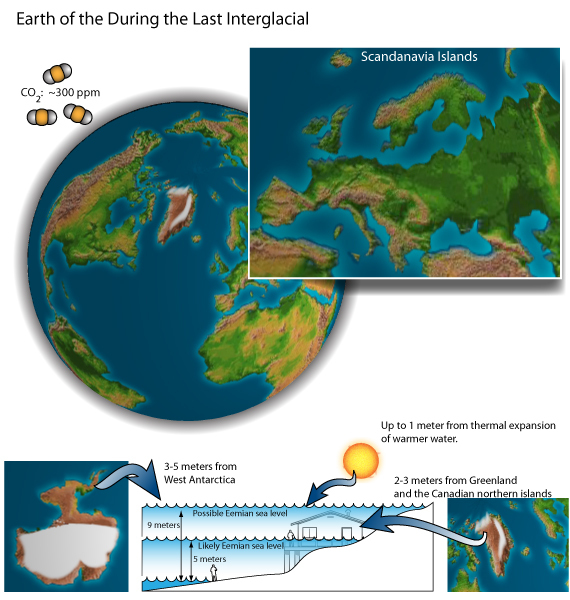 The last interglacial period occurred before it, from around 130,000 to 115,000 years ago. It's official international name is the Eemian, but it has other names in specific places. Climate information from that time is particularly useful. During that time, temperatures on earth were higher at the poles than they are now. The sea level was between five and nine metres higher than current levels, because of the melting of ice in Greenland and Antarctica. In the UK, this last interglacial period is called the 'Ipswichian'. 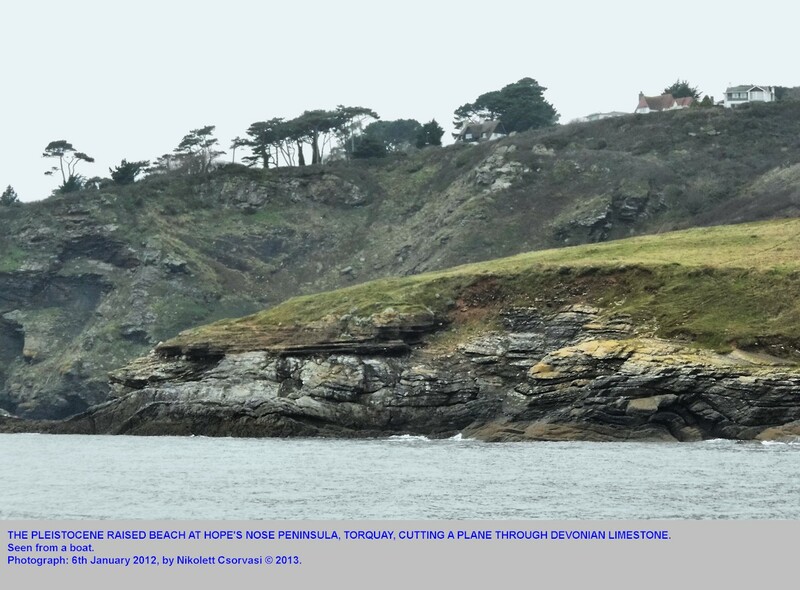 Above, an interglacial 'raised beach' deposit at 9 metres above sea-level. This pebble, shell and sand accumulation is "Ipswichian" in age. The warming during the last interglacial period was due to natural causes. These were basically changes in solar radiation hitting the earth, due to the tilt of the earth on its axis. We can use past climates as a natural experiment on the Earth’s systems, to consider the way it reacts to warming. This earlier warm period is useful to estimate what the future has in store, but had some different features. The Eemian began when the previous glacial stage ended, and that glaciation was on a bigger scale than the more recent one that came before our interglacial, the Holocene. New research has helped to explain the processes that happened as that earlier glacial stage ended. Because more melt water ended up in the north Atlantic, the Arctic appears to have remained colder during the Eemian than it has during the Holocene.